THere was an mtn person at my house a day or so ago (ran around looking for signals) , and said they will do something with the towers around me ... so i live in hope hehe. will let you yguys know what happened. I have been experiencing terrible voice and data connection in Ellisras since approximately 2 weeks ago. Calls to 808, 1555 and 083-900-1212 eventually resulted in a "logged call" last week, unfortunately nothing has improved and so far no feedback from MTN on the issue. Tonight I was told that unfortunately a call can not be logged again because 083-900-1212 for network related queries is routing back to 808 (Customer Care) and they can not log a call. Is there anyone from MTN on MBB that can assist and at least provide feedback when this problem will be resolved in the Ellisras/Onverwacht area? Was there a problem with mtn last night? 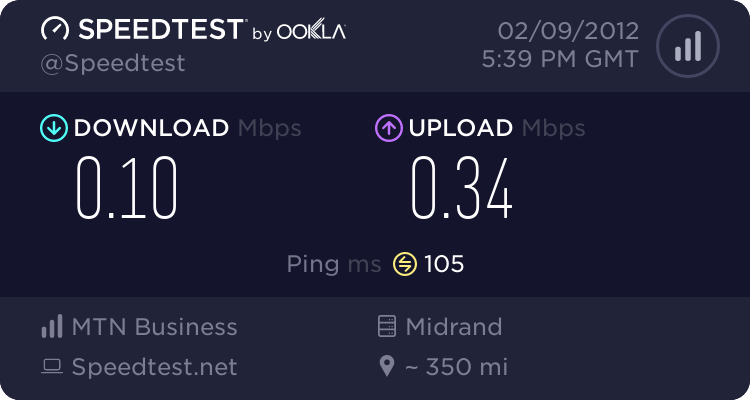 I had really crappy connection, could not go on almost any sites, only Facebook seemed OK.
Is MTN down in Sandton (near corner of Rivonia and Grayston drive) at the moment (17:15 16 November ? ). Some users cannot make calls to other networks, others have no signal. Really struggling to get any signal in Sandton for last two days. 3g is a no-go around Benmore. MTN Connection Issues. No assistance!!! Do anyone know where I can check in regards to faults on towers etc. The reason I am asking is that I am only getting GSM services on multiple phones. GPRS, Edge, 3G and BIS/BES Services is all down. If I climb in my car and drive away say between 3 or 4 km away then services seems to be picked up from other tower fine. I called 083 900 1212 but the service is not too good and they cannot even give me a reference number. When you enquired, what did they advise? They did not advise anything. They stated that they will monitor the tower or send a technician out to investigate. In regards to the CellID, is this the towerID you are talking about? Yesterday: I phoned again and they stated they have another problem in the area in regards to power but our signals worked fine on GSM. Today (10am): Seems some services is back online as data is being push through. Will monitor and give update later. Anyone in the Sandton area near Investec/RMB having problems? is it a mtn capacity problem ? You might try calling MTN technical department on 1555 if they still have it - take the following thread into account, perhaps, even though from a year ago. to choose to speak to a darn operator when you call 1555? I have phoned them before and they really know their stuff on data. Do not even try to get through to those clowns!! You will waste your time. I have been unable to connect to the internet for 2 weeks now and have phoned 083 900 1212 and 083 1555 numerous times and I am still not any closer to having my problems resolved. So I am cancelling my contract with them as I am unable to browse at all!! What a bunch of clowns MTN are, they put you on hold for 30 minutes and longer, I just disconnected the call after 30 minutes, refuse to wait so long, they don't even give progress of how long it will take, all they play is their silly whistling song in the background. This is InterNOT at its finest. The past week or so in Glen Austin in Midrand we've been having very unstable service, even though we never go off of HSPA or WCDMA. We'll have high latency for hours and then suddenly it'll be fine again for an hour or so then back to lag city. And getting anything out of their help desk seems to be impossible... Attached two pingtest.net screens taken 15mins apart. As you can see we jump from 700ms ping AND jitter to over 1000ms ping and jitter to a server in the UK. Before this I consistently got ~200ms ping with max 50ms jitter.